Kemp’s debut fantasy-thriller takes place in a world ruled by supernatural beings threatened by a looming horde of lost souls in the heart of Atlanta. Seven years after the “supernaturals” took the world from the humans, Mutt, a half-breed—his mother’s a witch, his father's a werewolf—seems to prefer solitude. But he finds himself party to an imminent war between the surviving humans, many hiding behind the walls of Fort Buckhead, and the vampires, led by the queen, who’s upset that Mutt refused an offer to join her clan. Everyone, however, is menaced by Dead Town, an ever-expanding region of black magic from which most don’t return. The devastated lands—half the human population is gone—feel dystopian, and Kemp meticulously establishes this new world with searing details: a precarious truce between the supernaturals and humans; frequent orgies, for both indulgence and procreation; and complex villainy featuring Mutt’s vamp friend Darryl, who’s seemingly reluctant to partake in violence against humans, and a powerful wizard who holds no allegiances. Mutt may not be the most sympathetic protagonist (he’s isolated himself even from his family), but he’s certainly unique: He’s the only werepanther, at least in this book, and for guidance, he has a rare earth spirit: Ed, a talking cat. Mutt can also communicate with the ghosts that populate Dead Town. His exceptionality is why the vampires want to turn him and why he’s enlisted by the queen to find a way through Fort Buckhead’s hefty defenses and trace the wizard or witch who’s likely responsible for creating Dead Town. 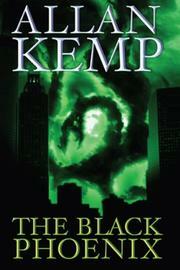 Kemp fills his book with intense scenes, like the gripping battle with Mutt and his pseudo-girlfriend Celeste, and plenty of mystery, including the ominous and recurring phrase “The Black Phoenix shall rise again.” There’s humor too; it’s easy to forget that Ed’s a cat, until he laps up his vodka. Some questions in the story are left unanswered, though a sequel should resolve those issues. An exquisitely detailed, fantastic realm of wizards, witches, vampires and werecreatures that’s begging for a series.